I think nearly every year there is one thing I don't quite finish planting. 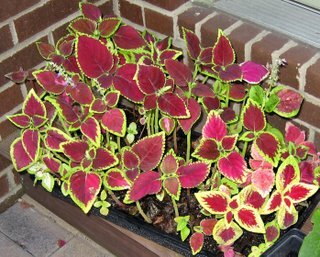 This year, it was this flat of coleus. I sowed the seed in early April and planned to use them in various containers. Then it was May and I didn't get them planted because I planted everything else first and ran out of time. Then came June which flew by into July. Then July was really hot. Now it's nearly the end of August. I am a bit surprised that they still look pretty good, in spite of being stunted by living in this flat all summer (which by the way, unless it cracked, doesn't have any drainage holes). I think now I might try to turn these into little topiaries, as shown in this Garden Gate article, and try to overwinter them in my sun room. Gads, I just hate talking about 'overwintering' already! But, soon it will be time. I figure I've got another month or so and then it will be time to start figuring out what goes into the compost bin and what I'll try to overwinter. Gads. Wow - have just looked at the article. I had no idea that coleus could grow so tall, or that it could be trained in that way. Let us know how you get on. We know fall is soon to arrive as we are selling pansies, snapdragons, violas, and fall vegies. After the last two extremely rainy winters and springs I hope we get a break from the real rough weather. Trey... I heard a rumor we were in for a rough winter, or so some almanac said. Need to track that down! It's just way too soon to think about over wintering...I'm not ready for that yet! Carol, this is one of the lovely things about the 'blogosphere' - when we hear from another gardener who never quite gets everything planted, our own leftover plants seem normal instead of a mistake. Good luck with your topiary experiments - I'm tempted to check the local nursery for a couple of overgrown specimens and give it a try, too.